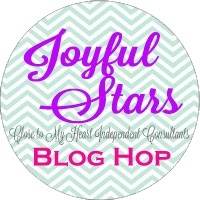 Hello and welcome to the Joyful Stars December Blog Hop. Although I keep checking the calendar - the weather almost fells like Spring! This is a circular blog so you can just hop along and when you get back to the first blog you visited, you will know you have seen all the projects. Joyce has the complete list of hoppers on her blog here. If you arrived here from Donna's Blog, then you are on the right track. I am still enjoying the beautiful White Pines paper packet. 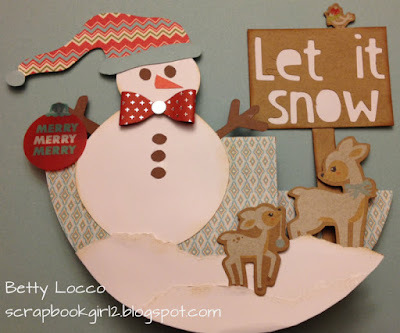 It is not only useful for Christmas cards and layouts, but winter/snow items too. Here is a card called a circle side step card. It is not quite what I envisioned when I started - but this is quite often the case for me. I have an idea that evolves and ends up somewhere completely different than what I originally imagined. But that is part of the fun for me. The card is actually quite large. The original circle was cut in the White Pines blue background and texture paper and was 6 3/4". The completed card is about 7" x 6 1/4" and definitely will not fit in a standard envelope. However, I really like the dimension created by the steps. The snowman is cut using the new Artistry cartridge. He is on page 47 of the booklet and he is cut at 4". The sign was also cut using the font from the Artisty cartridge. The accents (ornament, deer and bird) are from the coordinating White Pines Complements. The complements contain so many cute animals and great accents for both cards and scrapbook pages. Looking at the card now, I think it would make a beautiful "Baby's First Christmas" card. The ornament could have the baby's name and the sign could say "First Christmas". Here is another photo - I purposely made the snowman large because I planned to use a bow tie from the "Fundamentals Assortment". However, after I made the snowman, I could not find the bow ties! Crisis averted - I finally found them so now Mr. Snowman is properly dressed! BTW, the addition of this bow tie is for Joyce and Little Debi who are always trying to "bling up" my cards! Now it is time to hop on over to Yvonne's blog. Yvonne is hopping with us for the first time and I would like to welcome her! I love the little reindeer with the snowman. Together they equal one really cute card! Never thought to makea circle step card, way to go girlfriend. Hey, you need to check out the second photo I just added. It is for you! Oh wow! What a fun card! Really impressive card and I do like the bow tie. Great card, Betty and yes, the bow tie really makes it special. Happy Holidays! 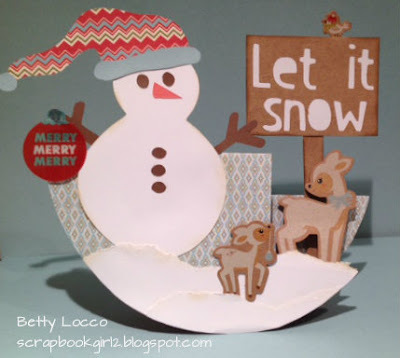 Love the nontraditional shape card! And I agree about the bow tie! Adorable! What a great card. The bow really set the whole thing off. Christmas always needs more bling!! !